Players will have a lot of fun trying to collect one of each type of treat while not waking granny. If you can you'll win. This fun kids game is exciting to play and will get kids giggling as granny's teeth come flying out. 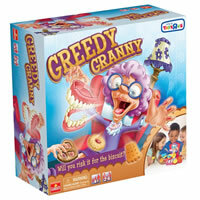 Intended for players ages five and up, Greedy Granny is a game that kids will want to play over and over. Playing doesn't take very long and up to four kids can play together. Tell us what you think about Greedy Granny and buy your copy today. Try to collect one of each type of treat while not waking granny and you win. You get a granny in her chair, 1 set of granny's teeth, 1 treat wheel, 12 treats and the official Greedy Granny game rules and instructions. Please keep in mind that the official Greedy Granny childrens rules and instructions could be different depending on the game version you have. The rules below are some of the exact directions on how to play Greedy Granny. Share with us your comments, funny stories, tips, advice, strategies, creative ways to play, questions about how to play, problems with the rules or anything you want about Greedy Granny. All submissions will be reviewed within 24 hours. Click here to add your Greedy Granny comments. You have to push the chair back kind of hard until it locks back. Then it will stay. We had trouble at first also. I'm having a lot of trouble getting granny's chair to lay back , hence, not being able to play the game. How do you get the chair to recline? Pushing it back doesn't seem to work, I've tried it with teeth in, teeth out, biscuit tray full, biscuit tray empty, and I can't get it to move! When I disassemble the chair into two pieces, the white switch thing on the bottom works to raise and lower the grannies arms and make her sleep and wake, but once I put the two halves of the chair together, I cannot recline the chair as it says in the instructions. I've just bought it for my daughter for christmas and it's very frustrating not being able to play! Can someone please help me with this? Every you tube video doesn't actually show anyone reclining the chair, the video jumps from being upright, to reclined , and it's so annoying not to find an answer to something that I think should be so simple! Please help! Thank you! !